Prominent & Leading Exporter from Chennai, we offer causal cotton sarees, silk designer sarees, cotton sarees, georgette designer sarees, party wear zari cotton sarees and designer sarees. We are leading Supplier, Trader, Wholeseller and Exporter of Causal Cotton Sarees. We are the Leading Supplier,Trader,Exporter and wholesaler of Latest Silk Designer Sarees in Chennai,Tamilnadu,India. We are the Leading Trader,Supplier and Wholesaler of High Quality Cotton Sarees in Chennai,Tamilnadu,India. 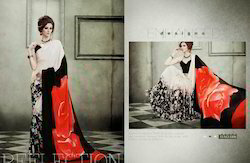 We are the Leading Supplier,Trader,Exporter and Wholesaler of Georgette Designer Sarees in Chennai,Tamilnadu,India. We are the Leading Manufacturer,Supplier and Exporter of Party wear zari cotton sarees in Chennai,Tamil Nadu,India. We are the Leading Supplier,Trader and Wholesaler of Designer Exclusively Sarees in Chennai,Tamilnadu,India. We are the Leading Supplier,Trader,Exporter and Wholesaler of Printed Line Cotton Sarees in Chennai,Tamil Nadu,India. 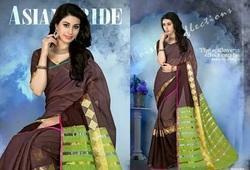 We are the Leading Supplier,Trader and Wholesaler of sarees in Chennai,Tamilnadu,India. 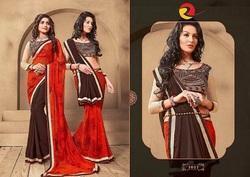 We are devoted on our customers, engaged in offering amazing range of Designer Sarees For Women. The offered printed suits are stitched by using top quality soft fabric material and advanced machinery keeping in mind latest trends. Our offered printed suits look more beautiful withDesigner Sarees For Women the accessories. Our Customers can purchase these printed suits from us in vivid colors combination and designs patterns as per their needs. We are the Leading Supplier,Trader and Wholesaler of Tussar Silk Sarees in Chennai,Tamilnadu,India. We are the Leading Supplier,Trader and Wholesaler of Ladies Wear Sarees in Chennai,Tamilnadu,India. We are happily proving our customers exclusive range of Trendly Designer Cotton Sarees. Our offered ladies suit is widely demanded among ladies for wearing on party or any other occasions. It is stitched & designed from the soft & finest fabric, our ladies suit add gleam to the wearer’s personality and enhance their appearance. Its amazing embroidery work makes our ladies suit more attractive & different from others. We are giving these ladies suit at the reasonable rates. Delivery Time: A week from the day of the order placed. We are the Leading Supplier,Trader ,Exporter and Wholesaler of Embroidery Work Sarees in Chennai,Tamilnadu,India. We are the Leading Supplier,Trader,Exporter and Wholesaler of Bridal Designer Sarees in Chennai,Tamilnadu,Inidia. We are the Leading Supplier,Trader,Exporter and Wholesaler of Classy Cotton Sarees in Chennai,Tamilnadu,India. We are the Leading Trader,Supplier and Wholesaler of Bollywood Designer Sarees in Chennai,Tamilnadu,India. Focused on technological up-gradation, dynamism and innovation, we are moving ahead by maintaining timeliness in delivering a wide gamut of Exclusively Printed Sarees. This suit is crafted with the help of supreme quality fabric and contemporary designing machines under the guidance of skilled fashion designers. 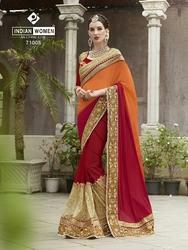 We are passionately engaged in providing an exclusive array of Naunihal Cotton Zari Worked Sarees. With the ultra modern technology and skin-friendly fabric, our domain-experts design this suit as per the global quality norms. We are offering this suit to our clients at highly affordable price. 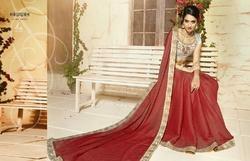 Can be worn in functions and parties, provided suit is available in myriad of attractive colors and unique designs. We are the Leading Manufacturer,Supplier and Exporter of Traditional Zari Worked Sarees in Chennai,Tamilnadu,India. We are the Leading Trader,Supplier and Wholesaler for Stylish Floral Print Sarees in Chennai,Tamilnadu,India. We are the Leading Supplier,Trader and Wholesaler of Embroidery Designer Sarees in Chennai,Tamilnadu,India. We are the Leading Supplier,Trader and Wholesaler of Fancy Georgette Designer Sarees in Chennai,Tamilnadu,India. We are the Leading Supplier,Trader,Exporter and wholesaler of High Quality Cotton Sarees in Chennai,Tamilnadu,India. We are the Leading Supplier,Trader and Wholesaler of Fancy Border Designer Sarees in Chennai,Tamilnadu,India. We are the Leading Supplier,Trader ,Exporter and Wholesaler of New Silk Designer Sarees in Chennai,Tamilnadu,India. We are the Leading Trader,Supplier and Wholesaler for Georgette Traditional Sarees in Chennai,Tamilnadu,India. We are highly appreciated entity involved in manufacturing, supplying and exporting Georgette Sarees. Our offered suits are designed with utmost care and perfection using fine fabric that is procured from the most trusted and reputed vendors of industry. These suits owing to their fabrication with modern techniques are known for durable stitching and tantalizing enbroidery patterns. Furthermore, we intend to supply our products in durable packaging at pocket friendly rates to our prestigious clientele base. We hold extensive prowess as leading manufacturer, supplier and exporter of Stylish Floral Color Sarees. These suits designed and fabricated as per latest fashion trend using supreme quality fabric and ultramodern technology. Owing to these aspects, our offered suits are soft on skin, resistant to shrinkage and precisely tailored, which makes them highly cherished among our clients. Furthermore, these suits are supplied to customers in various designs and sizes at affordable price tags. We are well versed firm instrumental in manufacturing, supplying and exporting Embroidery Sarees. Designed by diligent professionals using high quality fabric, these suits are known for intricate design patterns and superb finishing. The entire ranges of meticulously designed suits are provided with traditional and timeless elegance. We offer these suits to our valuable clients at competitive market rates. We are the Leading Supplier,Trader and Wholesaler of Designer Ladies Sarees in Chennai,Tamilnadu,India. To meet the diversified needs of our prestigious customer, we are manufacturing, exporting and supplying a beautiful range of Designer Silk Sarees. Our knowledgeable designers keep in mind the latest market trends and make use of high quality fabrics to stitch this suit. We are the best manufacturer, wholesaler, and supplier to provide our prestigious clients with an exclusive range of Casual Wear Sarees. Appreciated for their unique design and stylish pattern, our offered designer suits are provided in bulk orders and in specified range of colors. We are the Leading Supplier,Trader and Wholesaler of Daily Wear Cotton Sarees in Chennai,Tamilnadu,India. It is due to our ability to meet the bulk orders of COTTON SAREES that we have been able to gain a commendable position in this domain. The optimum quality of the offered dresses is maintained at all times through various quality assurance checks conducted our team of quality controllers.